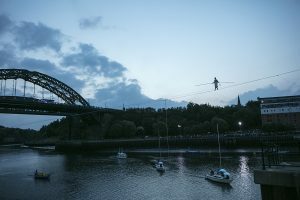 In 2017 we were commissioned by Sunderland Culture to create a world class, large-scale finale show to end the 4-day cultural festival programme as part of Sunderland Tall Ships Races 2018. 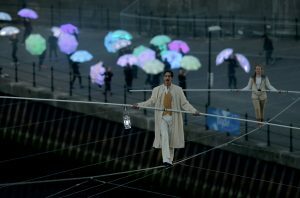 The show we proposed was one of the most ambitious high wire walks ever attempted in the UK. 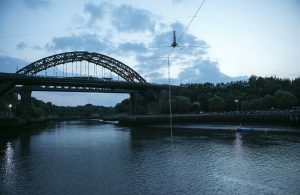 Expert wirewalkers Chris Bullzini and Johanne Humblet were to walk unharnessed along a 200m long highwire, to be suspended at a 35 degree incline, across the River Wear to the top of the Wearmouth Bridge. We had 6 months to bring the show together. 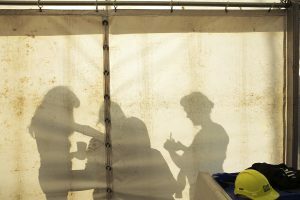 It was important to us, and our client, that the show was more than just a spectacle. 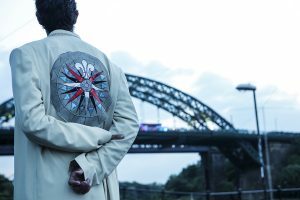 To infuse the show with a simple narrative, we commissioned composer Heg Brignall (Heg and the Wolf Chorus), originally from Sunderland, to create new music for a choir and band. 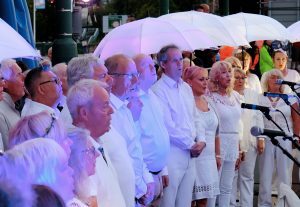 We recruited and rehearsed a 60-strong local choir to sing Heg’s songs alongside her on the Wearmouth Bridge on the night. 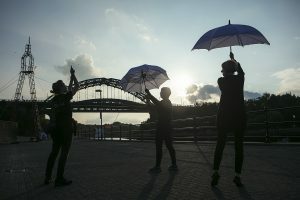 We worked with 40 local community dancers who learned special choreography with our LED umbrellas, to frame the show on the riverbanks. 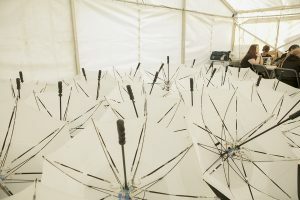 Sunderland Yacht Club provided a flotilla of 12 boats as part of the show. 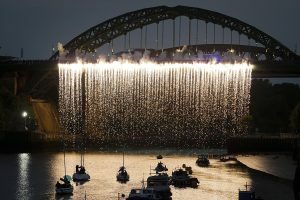 The show ended with a 40m pyrotechnic waterfall drop from Wearmouth Bridge as the wirewalkers reached their platform. Through several site visits, and remotely from our offices in Bristol, we worked closely with Sunderland Culture Team, the City Council, and their Production team, led by Mike Richmond of REM. 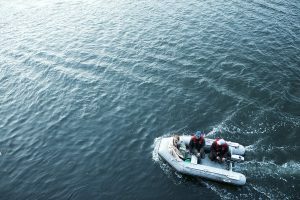 The biggest challenge was the schedule: we had two days within which to rig the wire, and its 40 supporting wires, across the river, and the river needed to be navigable throughout. 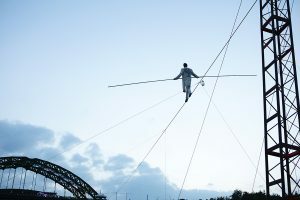 What made this performance so remarkable was the legacy it left with the 20,000 audience, 100 participants, local authorities and communities understanding that they had collectively witnessed history being made in their city. 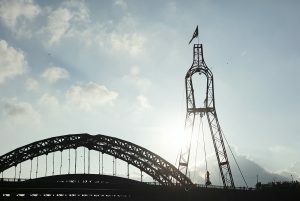 Images courtesy of Mark Pinder, Dan Prince and Sunderland City Council.